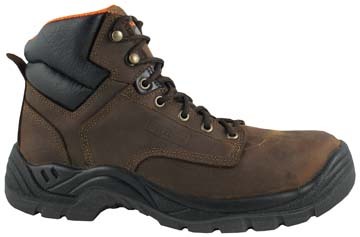 "Dixon" hiker boot gives protection from weather elements and gives the ASTM 2413-11 Steel toe boot rating. 6 inch top is waterproof to the 3rd eyelet. Direct attach sole seals the upper distressed leather to the sole. Direct attach sole is best for keeping the water out of your socks. Leather lining. Waterproof to eyelet three. Lining Taibrelle, Moccasin toe , heel unit, steel shank..
OUTSOLE: DIRECT ATTACH with Steel Shank.